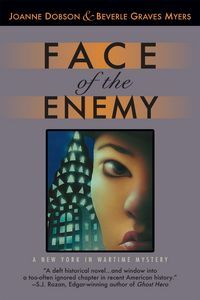 Face of the Enemy by Joanne Dobson and Beverle Graves Myers: Synopsis and Online Purchase Options. Synopsis (from the publisher): December, 1941: With New Yorkers painfully aware of their vulnerability after the Pearl Harbor attack, the FBI prowls the city snatching up Japanese residents. Tension increases for a sensitive Japanese artist when she's accused of murder as well as espionage. Is Masako Fumi guilty? Or a victim of racial paranoia? Nurse Louise Hunter is outraged and vows to help her friend. When the murdered body of Masako's art dealer is discovered in the gallery where he'd been closing down her controversial show, Masako's troubles multiply. Homicide detective Michael McKenna doubts her guilt, but an ambitious G-man schemes to lever the homicide and ensuing espionage accusations into a political cause célèbre. Struggling to focus on one man's murder while America plunges into a worldwide war, Louise and McKenna defy both racism and ham-fisted government agents in order to expose the real killer.